Somango 47 is a Indica strain earning itself the nickname "The Beast" in Marijuana forums and social networks. High yielder, powerful and delicious. With it you will live a very lasting experience. Somango #47 is a Cannabis strain that has quickly become famous in the world of Marijuanas. In fact, it earned the nickname "The Beast" in Marijuana forums and social networks: Somango 47 was created by crossing two highly productive and resistant strains, Somango and Critical 47 resulting in a real dark beast, high yielder, powerful and delicious. Somango #47 was initially tested by the Yerba magazine. Its success made Positronics to put it on the market. The plant grows as stocky, robust plant, showing a very compact development and short internodal distances. 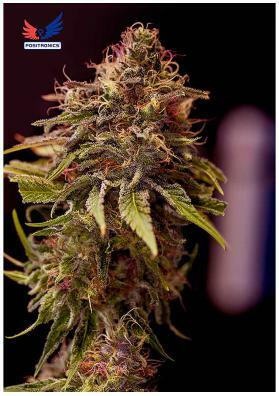 Quickly growing into a voluminous rounded bush-like shape and developing strong, thick branches capable of supporting the huge buds that harvest time will bring. and its success has convinced Positronics to the need of marketing it. From the beginning of its growth it becomes very compact but with an interesting development. The branches grow so much that the plant reaches a lot of volume in a short time and ends up having an oval or sphere shape. In fact, you have to be careful with this specimen since its huge flowers and buds may have the tendency to develop botrytis, or what is the same to say, mold on the buds! Due to its size you will be able to grow up to 16 plants per square meter being very suitable to be grown under a light regime of 12 hours. With such conditions and after in 65-68 days it will offer outstanding productions of more than half a kilo per square meter. Nonehteless, its in the garden where Somango #47 justifies its nickname "The Beast": in early September you can collect between 600 to 800 grams per plant of incredible flowers bursting with resin. If you want to potentiate its aroma and taste, we recommend to opt for an organic farming. The effect is fast-acting, powerful and durable, with a surpinsingly euphoric, uplifting sensation for an Indica dominant strain. The sweet and fruity flavoured smoke is smooth and satisfying, leaving a delicious lingering aftertaste in the mouth.